Jimmy John's introduced a string of surprising menu items last year; notably, an enormous 16-inch sandwich size and a totally refreshed wheat bread. 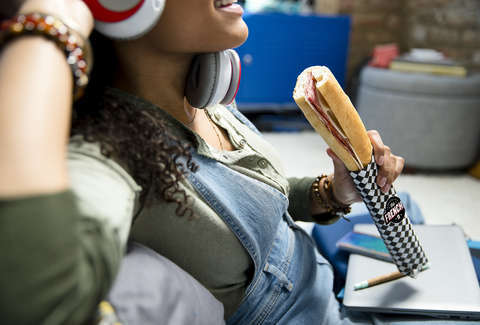 The super-sized sandwich option was, of course, a game-changer for longtime fans of the super-fast sandwich chain, but now, Jimmy John's is doing something it hasn't done in years: releasing a brand new sandwich. The sandwich chain with two first names formally introduced the new 13-inch sandwich -- the Frenchie -- on Monday, though it appears to have been available in at least some locations in recent days. As the new sandwich’s name suggests, it was inspired by food found in cafes and boulangeries in France. It’s made by spreading salted butter on a fresh baguette, then topping it with provolone cheese, salami, and capicola. A spokesperson told Thrillist it's the first totally new sandwich Jimmy John's has introduced in several years. Notably, Frenchie sandwiches aren't quite like other sandwiches on the menu, which are made to order. Instead, they're made throughout the day and served up as a grab-and-go option that's designed for portability -- as in you won't have any shredded lettuce or tomato bits falling out while you eat one. They're only around for a limited time, though, according to the company. Jimmy John's, which has more than 2,800 locations across 43 states, recently pledged to never team up with third-party delivery services to deliver its sandwiches and double-down on its stores' strict five-minute delivery radius in new commercials to maximize speed and freshness. Then again, you can't get much faster than grab and go, right?